You know Mr. King as the prolific writer of horror books. But talk to people within 20 miles of Bangor, Maine, and you get a different story — about a guy and his wife who started out small, always remembered their home, and gave back in the form of charity and building baseball fields and cracking jokes at local bookstores or movie theaters. Seems Stephen King has built a word-of-mouth brand around goodwill. We drove by the water park he built for the community, which doesn’t have his name on it. We drove by King’s house, saw a relatively modest home for a guy who makes millions. The gate was open, we were tempted to drive in, knock and say hello. 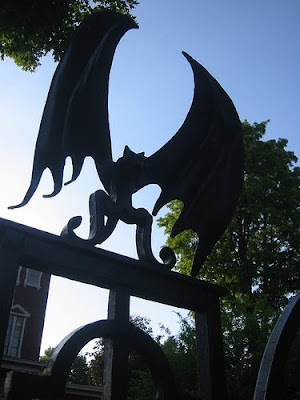 The wrought iron gates were a little goth, but didn’t fool us. We hear he’s just a nice guy. Funny thing, word of mouth. Changes your entire perspective of the official brand.